More light has been shed on a once secret Cold War spysat program. The National Reconnaissance Office (NRO) has released images of the POPPY system, a series of satellites built to scout out land based radar emitters in the former Soviet Union, as well as collect radar emanations from Soviet naval vessels. This type of surveillance from space is dubbed electronic intelligence, or ELINT for short. Last month, on September 12, the NRO formerly announced that the POPPY satellite system had been declassified. The newly released pictures show technicians with the spacecraft and the satellite itself, its Thor-class launcher sitting on a pad at the Vandenberg Air Force Base in California, as well as associated ground hardware used to operate the system. 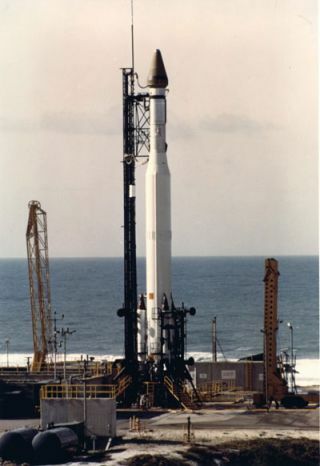 There were seven launches of POPPY spacecraft from 1962 to 1971, with the POPPY program operating from December 1962 through August 1977. POPPY was the successor to America's first ELINT satellite known as "GRAB" - standing for Galactic Radiation and Background. Originally developed by the Naval Research Laboratory, POPPY became a multi-agency system when the NRO was established in 1962, shortly before the satellite's first launch. The National Security Agency was also assigned the job of receiving, analyzing, and reporting findings derived from the intercepted radar signals from POPPY.